What is Tavin-EM (Tenofovir Disoproxil Fumarate/Emtricitabine) used for? HIV infects CD4 cells (also called T cells) in the body. These cells are important in fighting infection. Once HIV is contracted, the virus multiplies inside these cells and the subsequent viruses are then released into the blood and infect other CD4 cells. Tavin-EM works by inhibiting viral-specific enzyme reverse transcriptase (RT), which hinders the replication of the HIV-1 virus and results in a lower viral load (decreased amount of HIV virus in the blood). In some cases Tavin-EM can increase the number of CD4 cells in the body. How should I use Tavin-EM (Tenofovir Disoproxil Fumarate/Emtricitabine)? 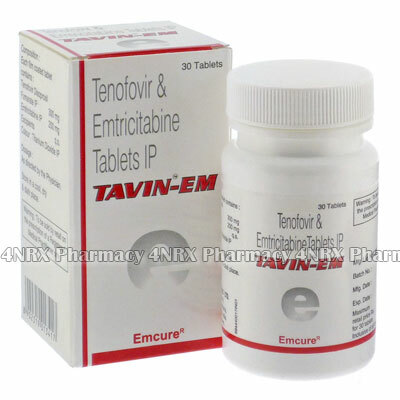 Tavin-EM is packaged as a bottle of 30 tablets. Each tablet contains 200mg of tenofovir disoproxil fumarate and 300mg of emtricitabine. Swallow the tablets whole with a glass of water. It can be taken with or without food. Take only the prescribed dosage (usually one tablet each day), and continue to do so for as long as recommended by your doctor. A sudden stop in taking Tavin-EM can increase HIV resistance. What are the side effects of Tavin-EM (Tenofovir Disoproxil Fumarate/Emtricitabine)?